As much as I try to keep politics out of my science vocabulary, there are some ties between the two that cannot be severed. Often, science in the United States is very linked to the government because funding can be dependent on federal, state, and/or local government decisions. Therefore, it is part of our responsibility as scientists to be, at least, informed on governmental proceedings. Last year, the U.S. Senate confirmed Retired Rear Admiral Timothy Gallaudet, Ph.D., as the Assistant Secretary of Commerce for Oceans and Atmosphere for the Department of Commerce in NOAA. 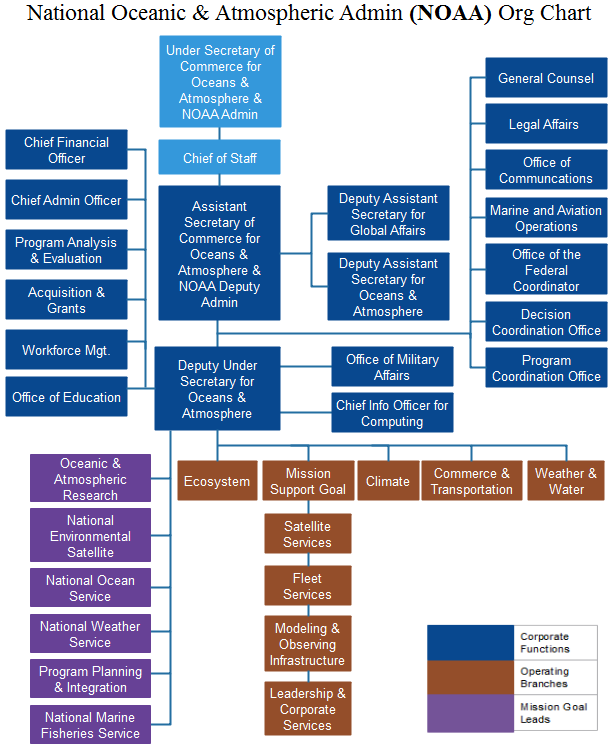 This position is an appointment by the current President of the United States, and is tasked with overseeing the daily functions and the strategic and operational future of NOAA. NOAA oversees the National Marine Fisheries Service (NMFS), which is an agency responsible for the stewardship and management of the nation’s living marine resources. NMFS is a major player when it comes to marine science, particularly through the determination of priorities for research and management of marine species and habitats within the United States’ exclusive economic zone (EEZ). Recently, I had the opportunity to hear Dr. Gallaudet speak to scientists who work for, or in conjunction with, a NMFS office. After the 16% budget cut from the fiscal year 2017 to 2018, many marine scientists are concerned about how budget changes will impact research. Therefore, I knew Dr. Gallaudet’s visit would provide insight about the future of marine science in the United States. Dr. Gallaudet holds master’s and doctoral degrees in oceanography from Scripps Institution of Oceanography, as well as a bachelor’s degree from the United States Naval Academy. He spent 32 years in the Navy before stepping into his current role as Assistant Secretary. Throughout the meeting, Dr. Gallaudet emphasized his leadership motto: All in, All Good, and All for One. Dr. Gallaudet also spoke about where he sees NOAA moving towards: the private sector. A prominent conservation geneticist asked Dr. Gallaudet how NOAA can better foster advanced degree-seeking students. The geneticist commented that a decade ago there were 10-12 PhD students in this one science center alone. Today, there is “maybe one”. Dr. Gallaudet responded that the science centers should start reaching out to private industry. In response to other questions, he continued to redirect scientists toward United States-based corporations that could join forces with government agencies. He believes that if NMFS scientists share data and projects with local biotechnology, medical, and environmental companies, the country can foster positive relationships with industry. Dr. Gallaudet commented that the President wants to create these win-win situations: where the US government pairs with for-profit companies. It is up to us, as the scientists, how we make those connections. As scientists, we frequently avoid heated political banter in the hopes of maintaining an objective and impartial approach to our research. However, these lines can be blurred. Much of our science depends on political decisions that mold our future, including how funding is allocated and what goals are prioritized. In 2010, Science Magazine published an online article, “Feeding your Research into the Policy Debate” where Elisabeth Pain highlighted the interdisciplinary nature of science and policy. In Pain’s interview with Troy Benn, a PhD student in Urban Ecology at the time, Benn comments that he learned just how much scientists play a role in policy and how research contributes to policy deliberations. Sometimes our research becomes of interest to politicians and sometimes it is the other way around. From my experiences collaborating with government entities, private corporations, and nonprofit organizations, I realize that science-related policy is imperative. California established a non-profit, the California Ocean Science Trust (OST), for the specific objective supporting management decisions with the best science and bridging science and policy. A critical analysis of the OST by Pietri et al., “Using Science to Inform Controversial Issues: A Case Study from the California Ocean Science Trust”, matches legislation with science. For example, the Senate Bill (SB) 1319, better known as the California Ocean Protection Act (COPA), calls for “decisions informed by good science” and to “advance scientific understanding”. Science is explicitly written into legislation and I think that is a call to action. If an entire state can mobilize resources to create a team of interdisciplinary experts, I can inform myself on the politics that have potential to shape my future and the future of my science. 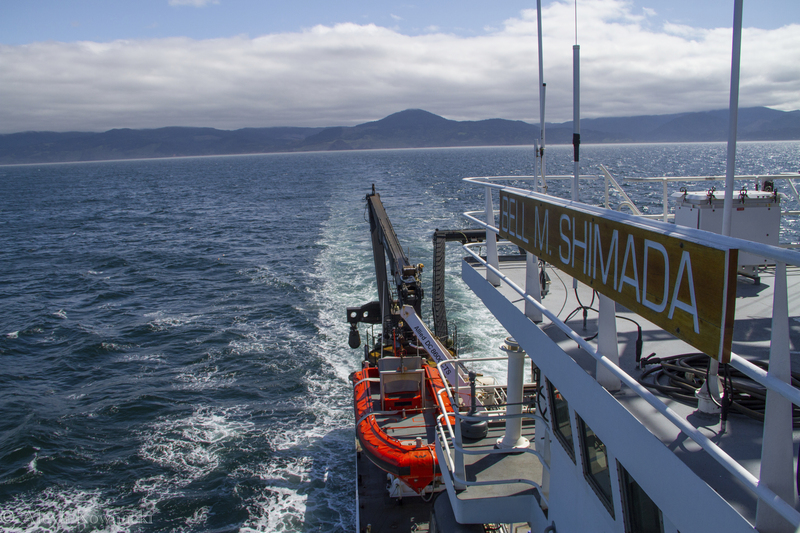 From September 22nd through 30th, the GEMM Lab participated in a STEM research cruise aboard the R/V Oceanus, Oregon State University’s (OSU) largest research vessel, which served as a fully-functioning, floating, research laboratory and field station. The STEM cruise focused on integrating science, technology, engineering and mathematics (STEM) into hands-on teaching experiences alongside professionals in the marine sciences. The official science crew consisted of high school teachers and students, community college students, and Oregon State University graduate students and professors. As with a usual research cruise, there was ample set-up, data collection, data entry, experimentation, successes, and failures. And because everyone in the science party actively participated in the research process, everyone also experienced these successes, failures, and moments of inspiration. Dr. Leigh Torres, Dr. Rachael Orben, and I were all primarily stationed on flybridge—one deck above the bridge—fully exposed to the elements, at the highest possible location on the ship for best viewing. We scanned the seas in hopes of spotting a blow, a splash, or any sign of a marine mammal or seabird. Beside us, students and teachers donned binoculars and positioned themselves around the mast, with Leigh and I taking a 90-degree swath from the mast—either to starboard or to port. 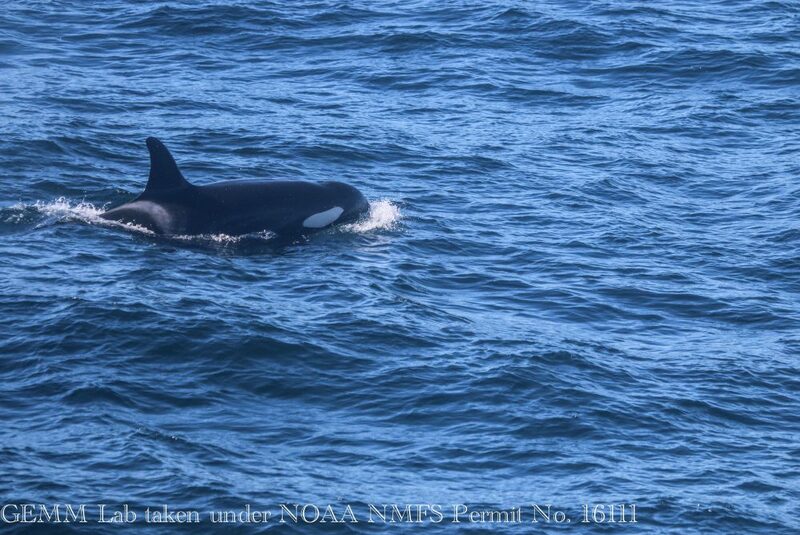 For those who had not been part of marine mammal observations previously, it was a crash course into the peaks and troughs—of both the waves and of the sightings. We emphasized the importance of absence data: knowledge of what is not “there” is equally as important as what is. Fortunately, Leigh chose a course that proved to have surprisingly excellent environmental conditions and amazing sightings. Therefore, we collected a large amount of presence data: data collected when marine mammals or seabirds are present. 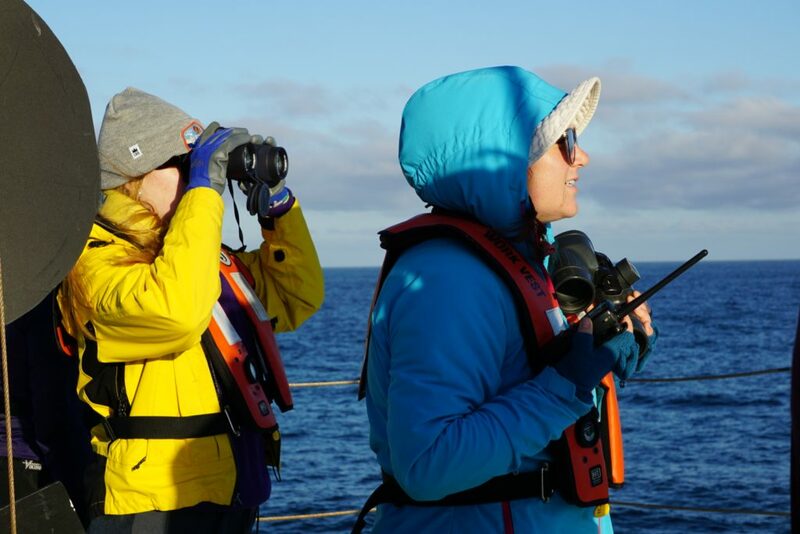 High school student, Chris Quashnick Holloway, records a seabird sighting for observer, Dr. Rachael Orben. (Image source: Alexa Kownacki). 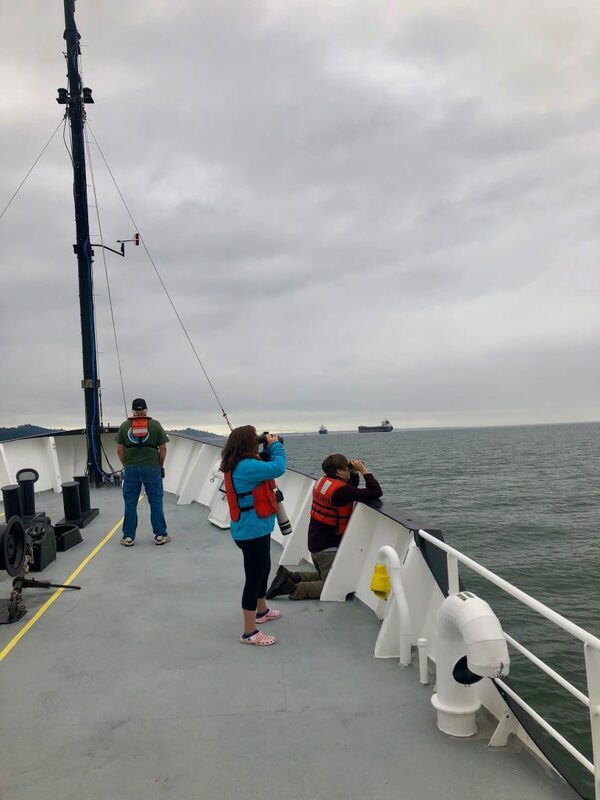 When someone sighted a whale that surfaced regularly, we assessed the conditions: the sea state, the animal’s behavior, the wind conditions, etc. If we deemed them as “good to fly”, our licensed drone pilot and Orange Coast Community College student, Jason, prepared his Phantom 4 drone. 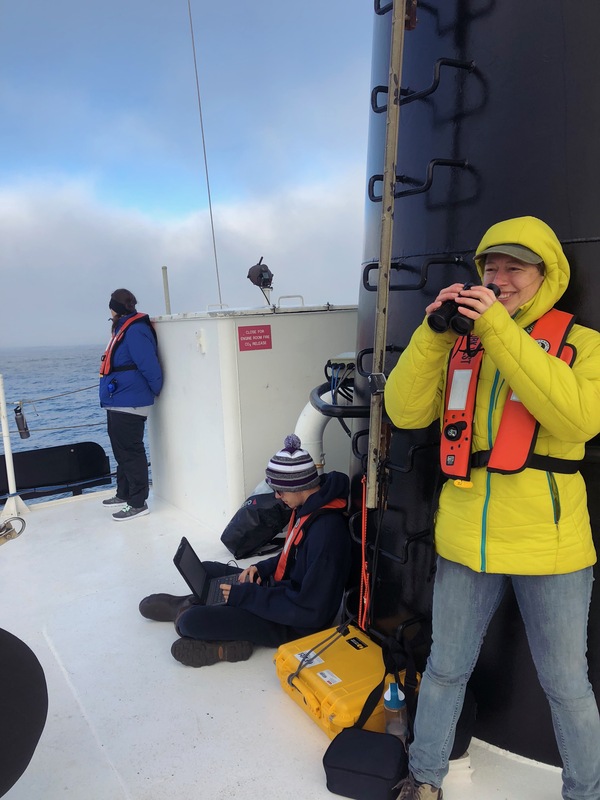 While he and Leigh set up drone operations, I and the other science team members maintained a visual on the whale and stayed in constant communication with the bridge via radio. When the drone was ready, and the bridge gave the “all clear”, Jason launched his drone from the aft deck. Then, someone tossed an unassuming, meter-long, wood plank overboard—keeping it attached to the ship with a line. This wood board serves as a calibration tool; the drone flies over it at varying heights as determined by its built-in altimeter. Later, we analyze how many pixels one meter occupied at different heights and can thereby determine the body length of the whale from still images by converting pixel length to a metric unit. Finally, when the drone is calibrated, I radio the most recent location of our animal. For example, “Blow at 9 o’clock, 250 meters away”. Then, the bridge and I constantly adjust the ship’s speed and location. If the whale “flukes” (dives and exposes the ventral side of its tail), and later resurfaced 500 meters away at our 10 o’clock, I might radio to the bridge to, “turn 60 degrees to port and increase speed to 5 knots”. (See the Hidden Math Lesson below). 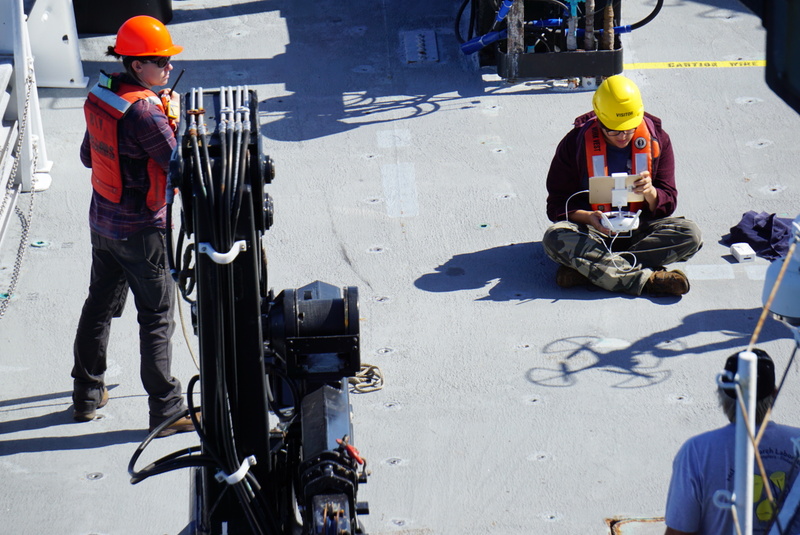 Jason then positions the drone over the whale, adjusting the camera angle as necessary, and recording high-quality video footage for later analysis. The aerial viewpoint provides major advantages. Whales usually expose about 10 percent of their body above the water’s surface. However, with an aerial vantage point, we can see more of the whale and its surroundings. From here, we can observe behaviors that are otherwise obscured (Torres et al. 2018), and record footage that to help quantify body condition (i.e. lengths and girths). Prior to the batteries running low, Jason returns the drone back to the aft deck, the vessel comes to an idle, and Leigh catches the drone. Throughout these operations, those of us on the flybridge photograph flukes for identification and document any behaviors we observe. 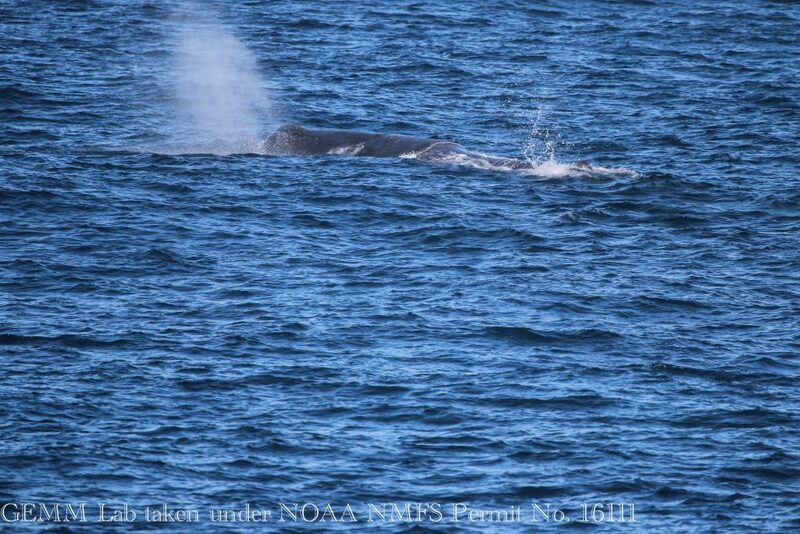 Later, we match the whale we sighted to the whale that the drone flew over, and then to prior sightings of this same individual—adding information like body condition or the presence of a calf. I like to think of it as whale detective work. Moreover, it is a team effort; everyone has a critical role in the mission. When it’s all said and done, this noninvasive approach provides life history context to the health and behaviors of the animal. Hidden Math Lesson: The location of 10 o’clock and 60 degrees to port refer to the exact same direction. The bow of the ship is our 12 o’clock with the stern at our 6 o’clock; you always orient yourself in this manner when giving directions. The same goes for a compass measurement in degrees when relating the direction to the boat: the bow is 360/0. An angle measure between two consecutive numbers on a clock is: 360 degrees divided by 12-“hour” markers = 30 degrees. Therefore, 10 o’clock was 0 degrees – (2 “hours”)= 0 degrees- (2*30 degrees)= -60 degrees. A negative degree less than 180 refers to the port side (left). Our trip was chalked full of science and graced with cooperative weather conditions. There were more highlights than I could list in a single sitting. 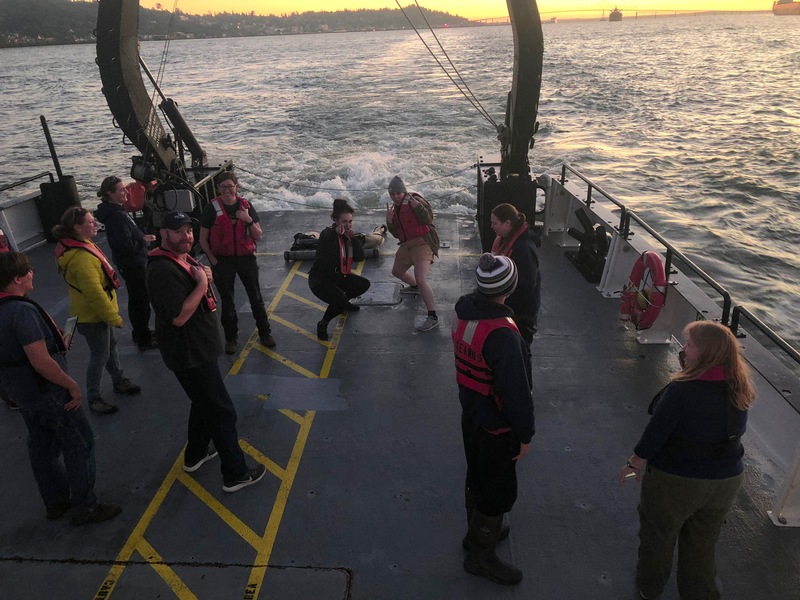 We towed zooplankton nets under the night sky while eating ice cream bars; we sang together at sunset and watched the atmospheric phenomena: the green flash; we witnessed a humpback lunge-feeding beside the ship’s bow; and we saw a sperm whale traveling across calm seas. Sperm whale surfacing before a long dive. 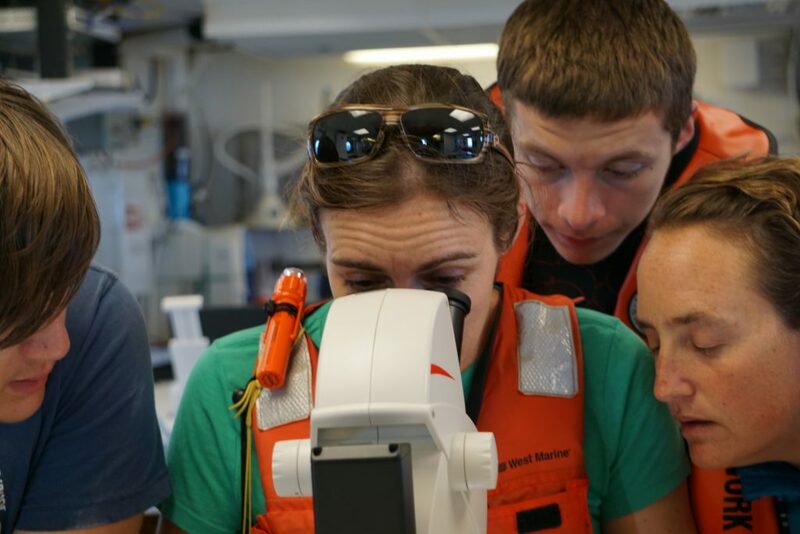 On this cruise, our lab focused on the marine mammal observations—which proved excellent during the cruise. In only four days of surveying, we had 43 marine mammal sightings containing 362 individuals representing 9 species (See figure 1). As you can see from figure 2, we traveled over shallow, coastal and deep waters, in both Washington and Oregon before inland to Portland, OR. Because we ventured to areas with different bathymetric and oceanographic conditions, we increased our likelihood of seeing a higher diversity of species than we would if we stayed in a single depth or area. 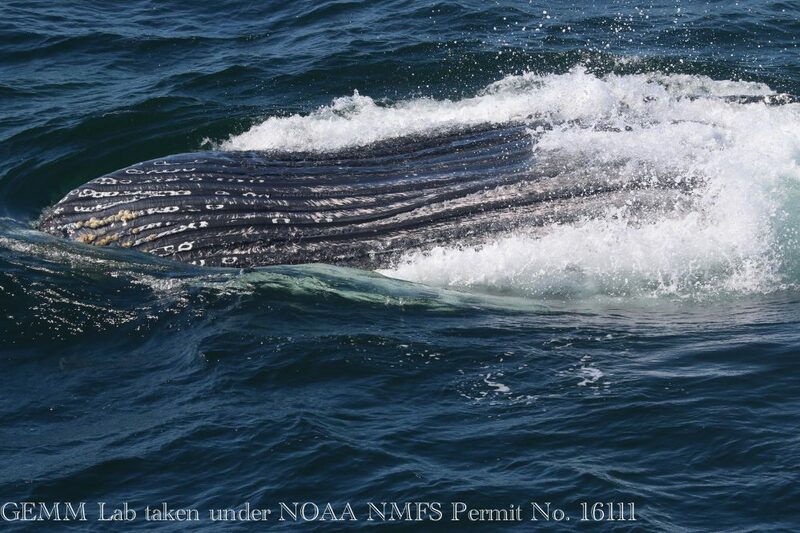 Humpback whale lunge feeding off the bow. Figure 1. Summary table of all species sightings during cruise while the science team observed from the flybridge. 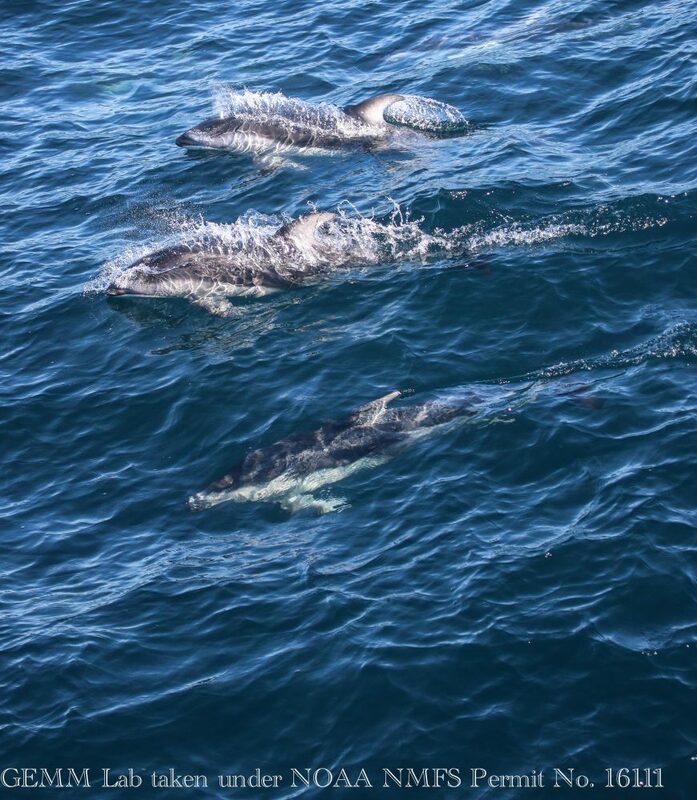 Pacific white-sided dolphins swimming towards the vessel. Figure 2. 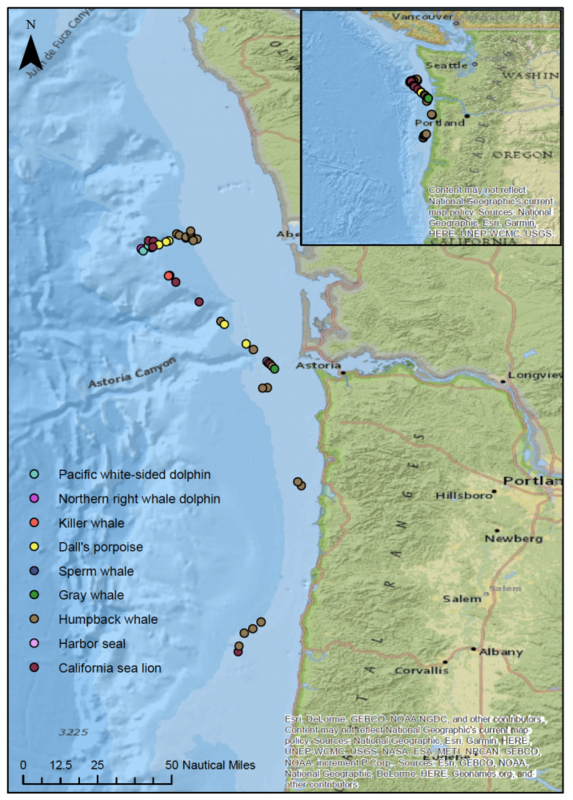 Map with inset displaying study area and sightings observed by species during the cruise, made in ArcMap. (Image source: Alexa Kownacki). Even after two days of STEM outreach events in Portland, we were excited to incorporate more science. For the transit from Portland, OR to Newport, OR, the entire science team consisted two people: me and Jason. But even with poor weather conditions, we still used science to answer questions and help us along our journey—only with different goals than on our main leg. With the help of the marine technician, we set up a camera on the bow of the ship, facing aft to watch the vessel maneuver through the famous Portland bridges. Video 1. Time-lapse footage of the R/V Oceanus maneuvering the Portland Bridges from a GoPro. Compiled by Alexa Kownacki, assisted by Jason Miranda and Kristin Beem. Prior to the crossing the Columbia River bar and re-entering the Pacific Ocean, the R/V Oceanus maneuvered up the picturesque Columbia River. We used our geospatial skills to locate our fellow science team member and high school student, Chris, who was located on land. We tracked each other using GPS technology in our cell phones, until the ship got close enough to use natural landmarks as reference points, and finally we could use our binoculars to see Chris shining a light from shore. As the ship powered forward and passed under the famous Astoria-Megler bridge that connects Oregon to Washington, Chris drove over it; he directed us “100 degrees to port”. And, thanks to clear directions, bright visual aids, and spatiotemporal analysis, we managed to find our team member waving from shore. This is only one of many examples that show how in a few days at sea, students utilized new skills, such as marine mammal observational techniques, and honed them for additional applications. Great science is the result of teamwork, passion, and ingenuity. Working alongside students, teachers, and other, more-experienced scientists, provided everyone with opportunities to learn from each other. We created great science because we asked questions, we passed on our knowledge to the next person, and we did so with enthusiasm. High school students, Jason and Chris, alongside Dr. Leigh Torres, all try to get a glimpse at the zooplankton under Dr. Kim Bernard’s microscope. (Image source: Tracy Crews). Check out other blog posts written by the science team about the trip here.